When you add a modern page to a site, you add and customize web parts, which are the building blocks of your page. This article focuses on the Page properties web part. 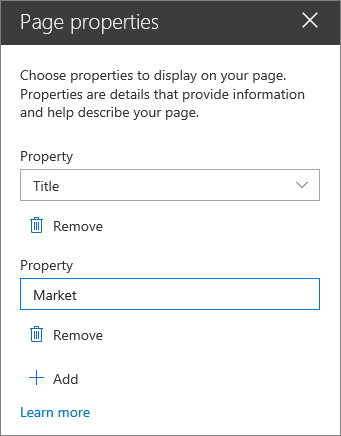 Properties are details that provide information and help describe your page, such as title, date, content type, or custom properties that you set by adding columns to your pages library. You can add properties of your page to your page to provide users with more information. Go to the page where you want to add the Page properties web part. Hover your mouse above or below an existing web part or under the title region, click , and then select the Page properties web part. Alternatively, click the Edit web part button on the left of the web part. 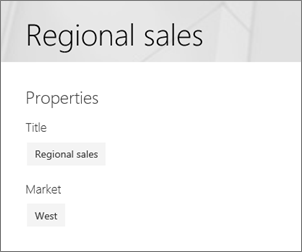 Click +Add in the property pane on the right, and choose the property to display in the Property dropdown box. Repeat this step to add more properties. To remove property, click Remove under the property.